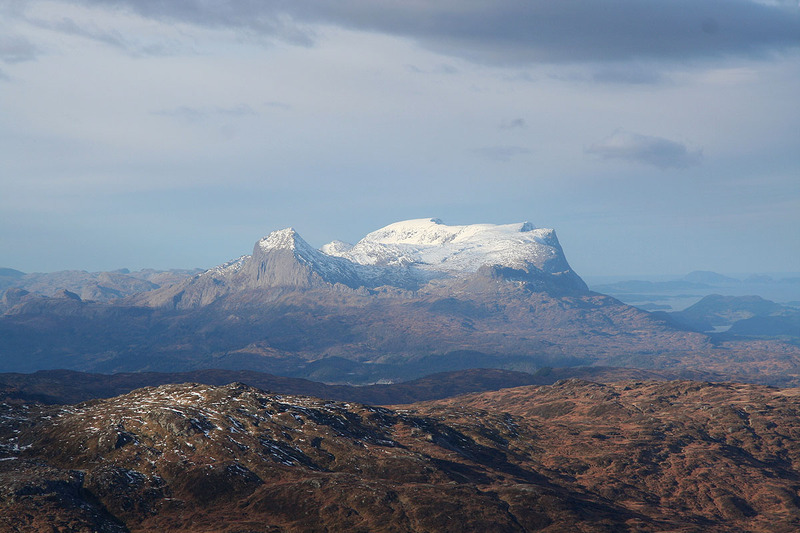 How to get there: One can access this mountain from the small village of Sande. Sande is located between Vadheim and Førde along the main Hwy. E-39. From Bergen, one must drive north on E-39 to Oppedal, take the ferry to Lavik, continue to Vadheim and then go north to Sande. As you cross the bridge in Sande, Hwy. 610 forks right. Measure from this intersection and follow Hwy. 610 about 20.6 kilometer, you should now approach an intersection where Hwy. 13 goes left, signed for Førde. At kilometer 22.8, you are in the small place called Vik. A smaller road signed with Roska 4, forks left. This is right next to a small, white church on your left side. Drive one kilometer, ie. to kilometer 23.8, where a small farm road goes right. 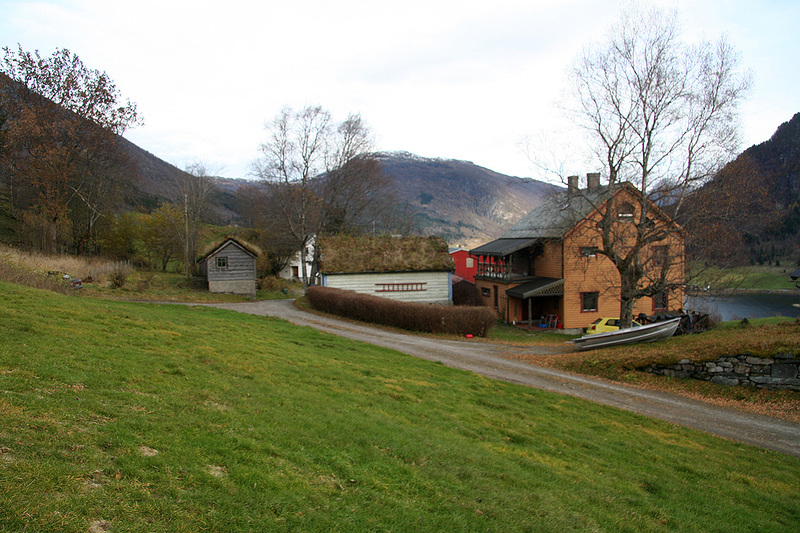 Drive this small road uphill in several big curves and you will arrive at the Halstad farm. Ask permission to park at the park. Most likely, you will park on the right side just after a small house with grass on the roof, there is a small place to turn here and one can park at its upper end. This is the trailhead, location N61:20.776, E006:05.603, elevation about 240 meter. 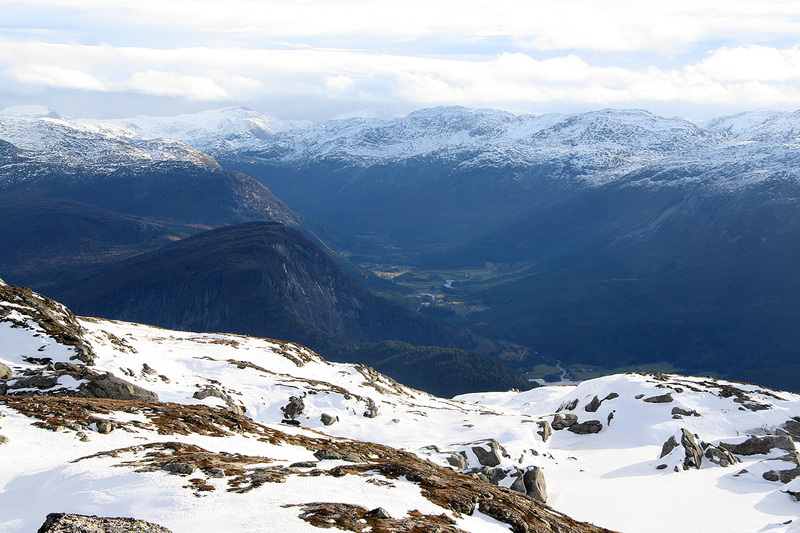 Route description: This route is also described in the book Opptur (Sogn og Fjordane), by Anne Rudseggen. 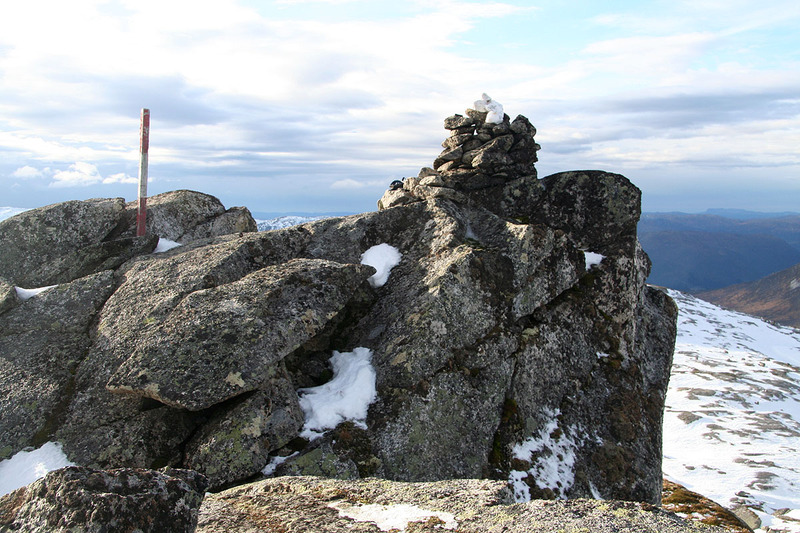 There is also a trail starting out from Nyddalsstølen on the north side of the summit, access by a private toll road. From the trailhead at the Halstad farm, follow a small (tractor) track up the first small field to the forest. There is gate here with a sign (in Norwegian) about the wild reindeer that live in this mountain. Go through the gate and head uphill. The trail is a bit vague in a few places, but should not be difficult to follow. It generally climbs while traversing left, however, there is a right turn fairly early, keep your eyes open and follow the trail. 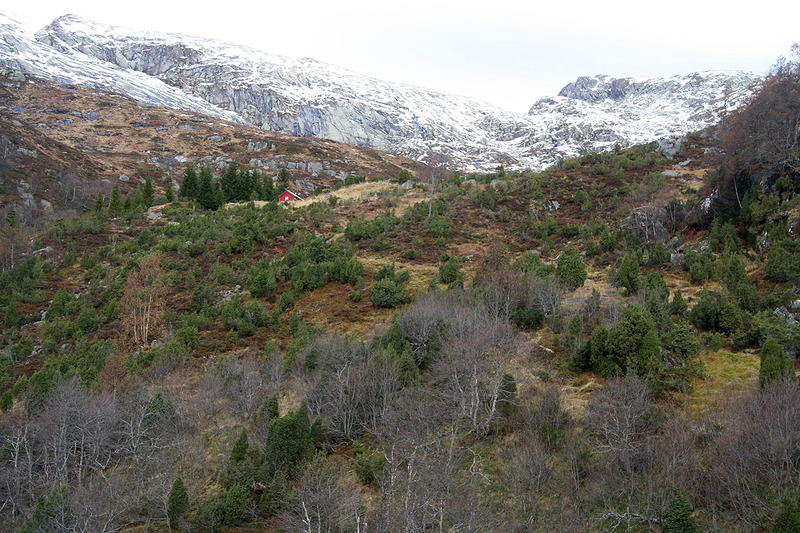 Contouring a bit, the trail enters into a small valley (called Storebotnen) and you will see a small red mountain cabin a bit higher up front. 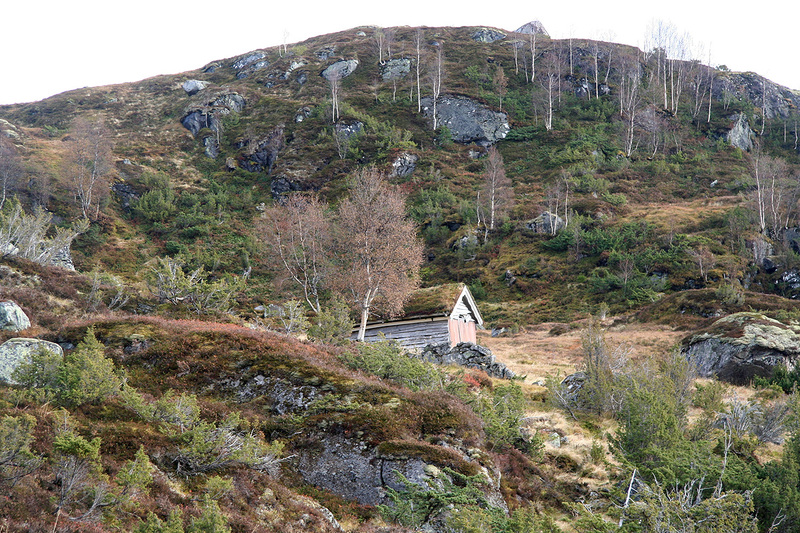 This cabin is at location N61:21.008, E006:04.359, elevation about 610 meter. Continue uphill along a small trail that may get difficult to see in a few places. This trail runs uphill pretty parallel to the creek that runs about 50 meter on your left side. 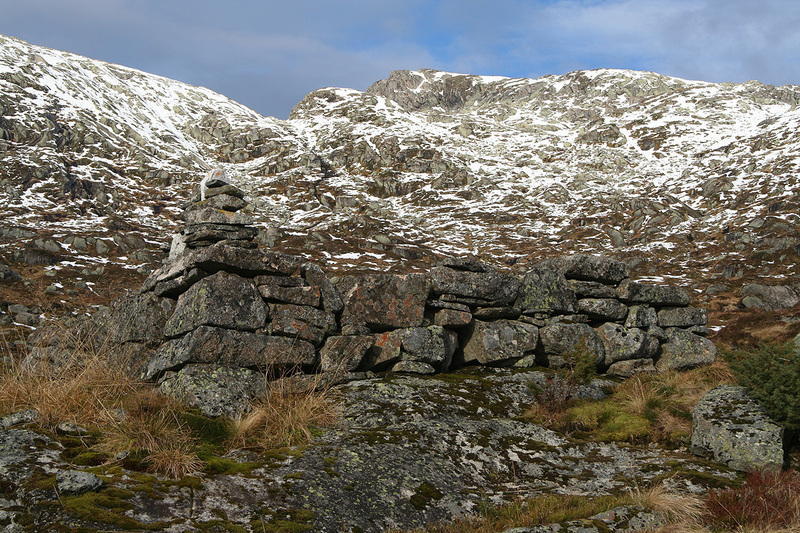 About 100 meter higher than the red cabin, you will see an old ruin with a cairn on top. Only part of the fundation is still visible. Continue straight uphill, then slightly right in order to avoid steeper terrain. There are several options here. Gain the main crest and continue a short stretch left in order to gain the highest point. Comments: I climbed this mountain solo. Starting out from Bergen at 0630, I knew that I would catch the first Sunday morning ferry across Sognefjorden at 0800. I arrived at the ferry queue around 0750, just as planned. There were already about 10 cars ahead of me in the line. However, at 0800 no ferry appeared. I looked all the way across the fjord without seeing any boat and realized that a major delay would occur. The situation was similar, but still different from a previous trip when the same ferry crashed into the docking area. A German tourist asked if I knew the reason for the delay and I answered "ich habe keine Ahnung", then proceeded to call my friend Arnt. Having called him and started to tell about the delay, it suddenly occured to me that we had set the time one hour back in order to move from daylight savings time to winter time. I went across and told the German: "Es ist Winter". The drive went well and I was soon parked at the Halstad farm, where a friendly farmer advised me about parking as well as where the trail to the farm mountain huts started. 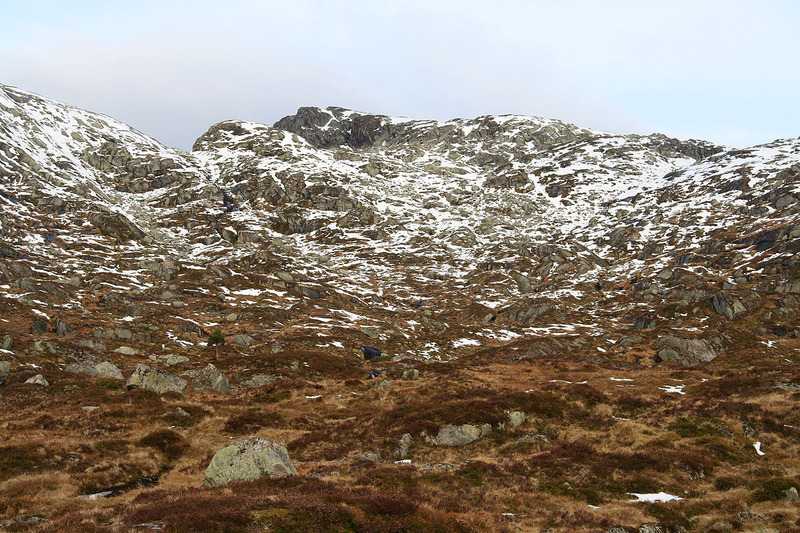 I left at 0940, reached the small red farm hut at 1015, and the summit at 1130. 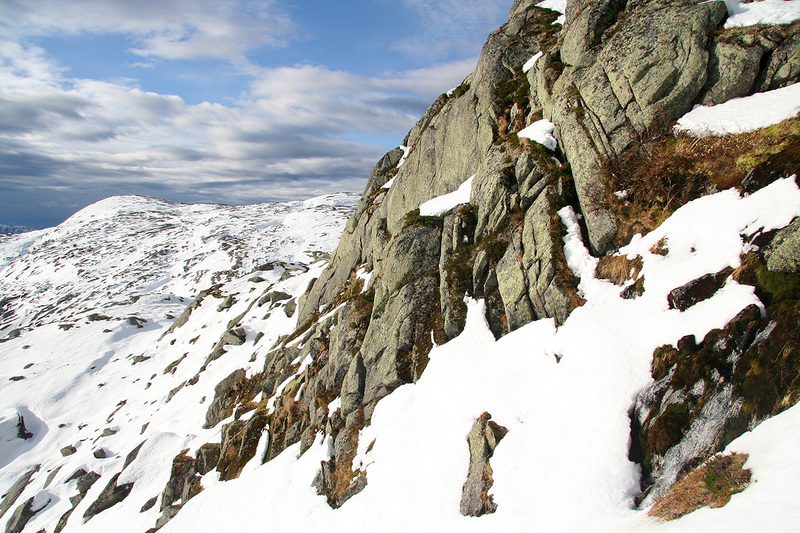 The upper part had snow, crust that would break without warning and send your leg sometimes as much as one meter into cracks between hidden boulders. 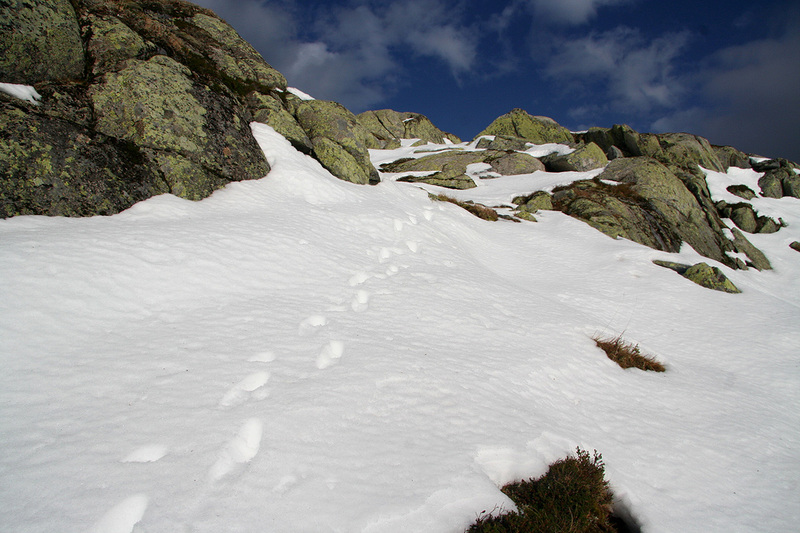 Care is in order as this sort of terrain and conditions easily can injure a leg. The climb was pleasant, but at the very upper part, I experienced very strong wind. At the cairn, I had to take care in order for my backpack to stay put. The sky was cloudy, but visibility waqs still pretty nice. After 15 minutes, I started back down and reached the car at 1300. 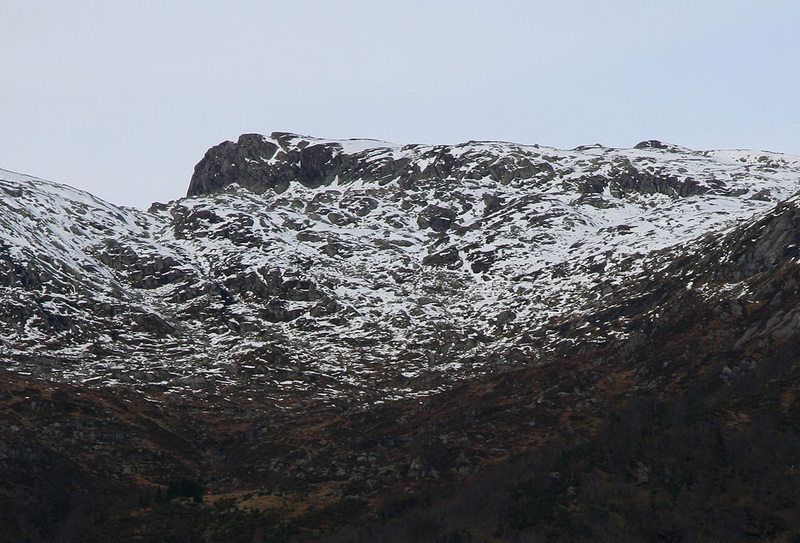 Svarteknibba, as seen from Hwy. 610. Steeper terrain near the top. Kvamshesten and Blægja are very impressive from this summit. 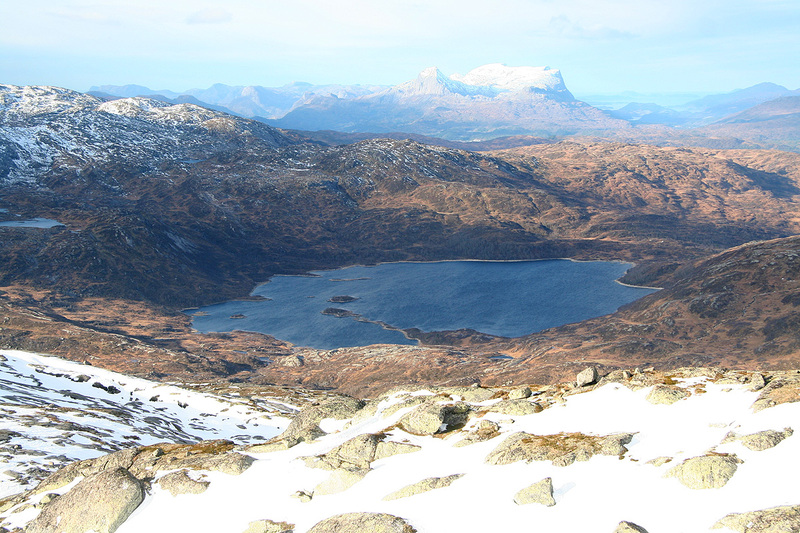 Gravvatnet, 600 m, Kvamshesten and Blægja behind. Valley view, the river Gaula runs into the lake. Farm cabin, this is near, but a bit east of the red cabin.